Join us at Peabody for our annual Fall Family Festival, this October, to celebrate the crispness of Fall in the air! The event is open to our residents, staff, and their families – designed to delight everyone from grandkids to older kids at heart. Come enjoy a BBQ lunch while listening to a Bluegrass band and checking out the antique tractors we’ll have on display. 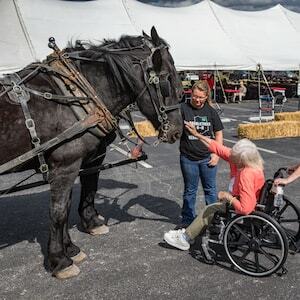 There will also be horse and wagon rides – which are wheelchair accessible, and outdoor games. Indulge your appetite for delicious barbecue. Hear great toe-tapping live music. Also, stop by the hospitality table in the large tent off 9th street to register and pick up a FREE gift! RSVP to (260) 982-0806 by September 28.